We've seen the improvement over the past three years, and it was time for Junior Monique Hardy (Webster Thomas) to check off another box. After breaking the sophomore State Record the year before, Hardy blew past the Junior Class equivalent this weekend. 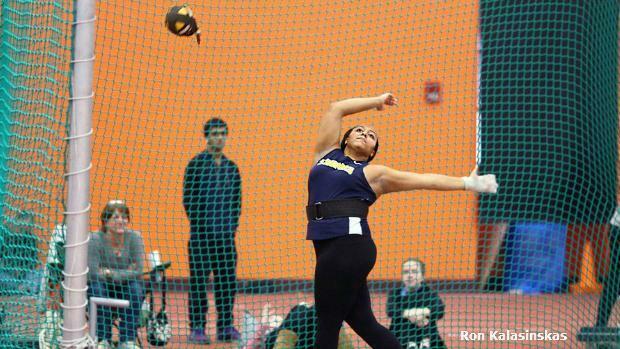 She threw the weight 62-9 at the Trent Jackson/Cedric Walker Invitational, held at RIT, improving upon a previous attempt that broke the record with a 62-2. The mark moves her US #6 All-Time in the event, and US #1 for 2019. Behind her in the competition, was a subtle reminder that records are made to be broken. Natalia Surdej (Lancaster), who holds the Freshman State Record, made good progress towards closing in on Hardy's Sophomore State Record. Hardy threw 54-7.75, before improving it to 56-1.25. On Saturday, Surdej pushed out a lifetime best of 55-4.25, closing the gap on that Record. It moves Surdej to NY #6 All-Time. All-in-all, it sets up for a thrilling State Competition, and shows the markedly improved marks since the events inception into the State Meet lineup. Maybe, just maybe, it could be an example of what including the Hammer Throw could do Outdoors.